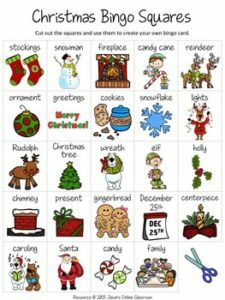 Christmas Free Create Your Own Luck Bingo – This resource includes 24 Christmas related images and vocabulary words and a blank “MY BINGO CARD” template that students can use to create their own unique Christmas themed bingo cards. Sign up for our EMAIL NEWSLETTER to receive important news, product announcements, and special deals and promotions. Make sure to FOLLOW US by clicking the STAR at the top of our store’s main page to be eligible to win a $25 TpT Gift Certificate every month. Visit our page on FACEBOOK for exclusive giveaways. We really do care about each of our customers and we make sure we do everything in our power to provide you with quality resources. Thank you so much for downloading from us. Have fun using this Christmas themed bingo resource!